Tile Flexure Testing Machine offered by us is fabricated as per IS: 1237 and 654, andÂ is used to determine the flexural strength of clay roofing tiles and cement concrete flooring tiles. We are one of the leading Manufacturers and Suppliers of Tile Flexure Testing Machines. Our Tile Flexure Testing Machines are manufactured using best raw materials to ensure good functionality and durability. 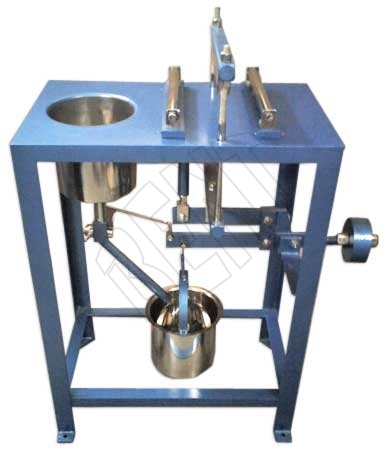 The Tile Flexure Testing Machine is a double lever loading machine where load is placed by a flow of lead metal that automatically stops as the sample breaks. The sample is mounted between rollers which are 40mm or 12mm in dia. The bearing rollers can be placed at center distances of 150, 200 or 270mm. Our Tile Flexure Testing Machine comes equipped with a 20 Kg lead metal.